So it’s the biggest college football weekend of the year. And I’m missing all of it. I am not doing so willingly. Friday, we had some thunderstorms in the area. Nothing too bad, though the rain was intense at times, and we had a few lightning strikes here and there. But it’s rained much worse, and we’ve had lightning last longer. Our DirecTV satellite dish system became inoperable at some point Friday afternoon. Two days later, still nothing. It would seem, after all the troubleshooting I’ve done, that the problem is the dish is out of alignment. My bride thinks the disalignment began with the severe cold snap we got last month, which brought in some ice, and we lost the satellite signal for about a day. She thinks, and I can’t find any fault in her logic, the weight from whatever ice collected on the dish was enough to begin the process, and wind since has steadily moved it more until it’s just off enough that we’re getting nothing. When we were turning in, and I just kicked on the satellite receiver for the heck of it. This morning, nada. Nothing. Reset all three receivers. Zip. Zero. On startup, the receivers never get beyond 0% in receiving the satellite signal. I’ve checked cables on all the receivers. I checked the cables in the OnQ box upstairs. My friend Drew suggested I disconnect one of the satellite lines from the multiplexer in the OnQ box and hook it directly in to one of the receivers, to rule out the multiplexer as the problem. So I lugged my JVC 13-inch television, and the attached receiver, from the study, upstairs to the OnQ box, and plugged it in directly. Still nothing. So, having ruled out everything else, it has to be the dish itself. This is what was determined yesterday afternoon, when, after 24 hours of no signal, I called DirecTV technical support. (Note: If you have to do this, never waste time with the first-line customer service reps. All of the ones I’ve spoken with have been pleasant, but they’ve got limited knowledge, and your best bet is to ask them to connect you to “second-tier tech support”, where more knowledgeable folks reside.) The tech rep I spoke with, after I explained to her everything I had done to that point, said it sounded like everything had been ruled out but the dish itself. So she scheduled a technician to come out to the house to get up on the roof to realign the dish. Just in case you didn’t catch that, the tech is coming on Thursday. Thursday, January 4th. After which there is only one bowl game of any significance, the BCS Championship Game. A little while ago, I finished watching “The Christmas Show” episode of Studio 60. The show closes with an awesome performance by New Orleans musicians who are supported by the Tipitina’s Foundation. The group performs one of my favorite Christmas songs, “O Holy Night”, and you can still snag a MP3 from Studio 60’s music page. Yesterday, my wife awoke to find our son still in his bed. Granted, he was awake, but he’s only three and still hasn’t quite figured out the whole Christmas morning, Santa has left presents, thing. So she went to get him up, and moments later he came in to our room. “Merry Christmas, buddy!” I tell him as Mom helps him up on the bed. “Merry Christmas, Daddy,” he replies, giving me as big a bear hug as his little arms can muster. If nothing else, those sixty seconds made this the best Christmas ever. I have some personal criteria for what constitutes a “visit”. For instance, I didn’t count the layover in Salt Lake City as a visit to Utah. I don’t think you can really call it a visit when you never leave the airport. Likewise, I didn’t count the short time I spent in Newark, leaving from the airport to go in to Manhattan, as a visit to Jersey. I don’t count the approximately two hours I spent at a friend’s father-in-law’s place in Oklahoma as a visit; we were there to pick up dad-in-law’s old big-screen television, and it was right back across the border in to Texas. However, though we didn’t spend a night in Maine, or Vermont, I count those as states visited, since we were there to see certain sites unique to the state, i.e., playing tourist. So you may feel otherwise as to what makes a “visit”, but that’s some of what I thought about when marking states. Verify a link isn’t from a phisher, or submit a phishing link for inclusion in the database (aka, the tank). Please note the lack of a c in this spelling of phish; these are scum of cyberspace which give a bad name to other, more friendly phisch. How would you like 20% off the best spam-killing app for the Mac? Or maybe 20% off the easiest disk image creator? Perhaps 20% off a professional text editor is more to your liking. Now that you’ve done all of your gift shopping for everyone else, treat yourself to discount savings on numerous Mac applications from top-notch developers with MacSanta. A “generic” font available in different styles. On September 25th this year, our church hosted a concert by Derek Webb, of Caedmon’s Call fame, along with his wife, Sandra McCracken. 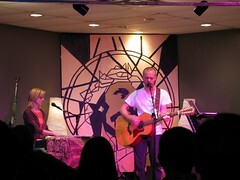 Derek Webb, accompanied by his wife, Sandra McCracken. I had a good seat (thanks, Samantha! ), and took a few shots of the couple as they performed, plus of the good-sized crowd before the concert, and in between sets. Beyond his lyrical abilities, one of the things I admire about Derek is his desire to simply get the message of God’s love out there. At one point during his set, he remarked how he was going to freak out all the lawyers and record executives by telling all of us to share his music with whomever we wanted to. Earlier this year, he had even gone so far as to put his latest album, Mockingbird, online as a free download. He says it was a very successful experiment.